What does the FDIC do? The Federal Deposit Insurance Corporation (FDIC) preserves and promotes public confidence in the U.S. financial system by insuring deposits in banks and thrift institutions for up to $250,000 (through December 31, 2013). What are the basic FDIC coverage limits? What types of accounts are eligible for FDIC insurance? FDIC insurance covers all deposit accounts at insured banks and savings associations, including checking, NOW, and savings accounts, money market deposit accounts and certificates of deposit (CDs) up to the insurance limit. The FDIC does not insure the money you invest in stocks, bonds, mutual funds, life insurance policies, annuities or municipal securities, even if you purchased these products from an insured bank or savings association. According to the FDIC, your money is safe. FDIC.gov – Check to See if Your Covered? Go to the FDIC website and use EDIE the Estimator to calculate your FDIC insurance coverage for each FDIC-insured bank where you have deposit accounts. EDIE lets you know in a printable report for each bank whether your deposits are within or exceed coverage limits. The Federal Deposit Insurance Corporation (FDIC) today launches a national campaign designed to help consumers learn about the benefits and limitations of deposit insurance. The campaign’s public service announcements (PSAs) will feature personal finance expert Suze Orman. The public awareness campaign encourages Americans to visit myFDICinsurance.gov, where they can use EDIE the Estimator, an online tool that provides customized information about their insured accounts. The estimator has been available to the public for a number of years but was simplified and made more accessible as part of this campaign. Those without online access may call toll-free 1-877-ASK-FDIC for assistance. Basic FDIC insurance covers up to $100,000 of deposits per account holder per bank, and up to $250,000 per account holder for deposit retirement accounts. myFDICinsurance.gov provides information about how these limits work. “We’re encouraging consumers to find out if all their money is FDIC protected, and we’re providing them the tools to do so,” said Chairman Bair. Congress created the Federal Deposit Insurance Corporation in 1933 to restore public confidence in the nation’s banking system. The FDIC insures deposits at the nation’s 8,451 banks and savings associations and it promotes the safety and soundness of these institutions by identifying, monitoring and addressing risks to which they are exposed. 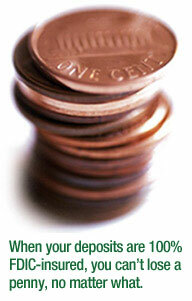 The FDIC receives no federal tax dollars – insured financial institutions fund its operations.